Henry E. Phillips. 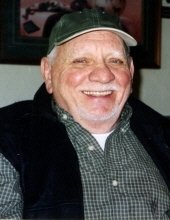 Age 85 of Lincoln Park, Michigan passed away Monday January 14, 2019. Beloved husband of Ladon for 60 years. Loving father of the late Sharon Jakubowski, Charlene (Louie) Darilek, the late Steven Phillips, Janet Phillips, Tammy Janes and Tracy (Kyle) Wrobleski. Proud grandpa of Jamie, Christina, Amanda, Brandy, Nick, Chelsea, Tiffany, Melanie, Kurtlan, Samantha, Jaclyn, John, Jacob, Jeremiah, Amanda, Courtney and Matthew. Great grandpa of 14. Preceded in death by his parents Homer and Lucretia Phillips and a sister Nora Lou Whited. Graveside service 1:00pm Sunday January 20, 2019 at Jellico Creek Cemetery, Williamsburg, KY, Rev. Gerald Mullins officiating. To send flowers or a remembrance gift to the family of Henry Phillips, please visit our Tribute Store. "Email Address" would like to share the life celebration of Henry Phillips. Click on the "link" to go to share a favorite memory or leave a condolence message for the family.